South Sudan’s rival leaders have signed a power-sharing deal to bring an end to five years of civil war in the world’s youngest nation. Businesses were closed in South Sudan’s, Juba, on Monday after the final draft of a peace agreement was signed by President Salva Kiir and rebel leader Riek Machar in Khartoum, the capital of neighbouring Sudan. Kiir called on everyone in the country to ensure that the agreement brings an to the conflict, following a number of failed peace attempts in recent years. “I call on everyone as a leader of South Sudan that this agreement which we have signed today should be the end of the war and the conflict in our country,” President Salva Kiir said after the agreement was signed in Khartoum. Meanwhile, rebel leader Riek Machar, who will return to South Sudan as one of five vice presidents under the agreement, said the entire world is celebrating a new era of peace for the country. South Sudan became independent from Sudan in 2011 after years of bitter conflict but Khartoum. 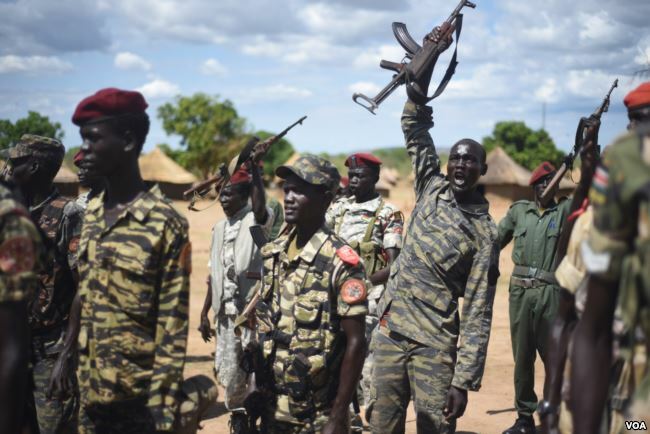 However, the newly-independent country only enjoyed a brief spell of peace until its own civil conflict broke out in 2013 with rebel troops led by Riek Machar taking arms against the government. A five-year-long power struggle has ensued with multiple peace deals failing to bring a definitive end to the conflict. A similar power-sharing deal to the latest one signed in Khartoum fell apart in 2011 and two ceasefires have been violated since, within hours of being implemented. Faith in the country’s leaders to implement any kind of peace deal remains low, as categorised by recent comments from the White House, but there’s significantly more pressure on the country’s elite to deliver peace this time around. South Sudan’s economy is shattered and the general public has become increasingly frustrated by the conflict while external pressure from the international community is mounting. South Sudan’s strongest critics accuse its leaders of profiteering from the conflict but there seems to be little room left for profit, making peace the only viable option left on the table.